The “centennial” issues of Amazing Spider-Man are similar to the season finale of your favorite television show – they are often entertaining and there’s a certain level of importance assigned to them, but it’s very rarely the “best” representation of the characters and their universe. That doesn’t change the fact that there are a number of ASM centennial issues that I hold in extremely high regard. ASM #300, as I say on almost a weekly basis, is one of my favorite single issues from my childhood, while ASM #400, is a tender and beautiful story that I’m not ashamed to admit that I love. Still, I also realize that my adoration for ASM #300 is definitely impacted by nostalgia, while the big moment from ASM #400 was later retconned out of existence in extraordinarily silly fashion, essentially rendering the whole story moot. 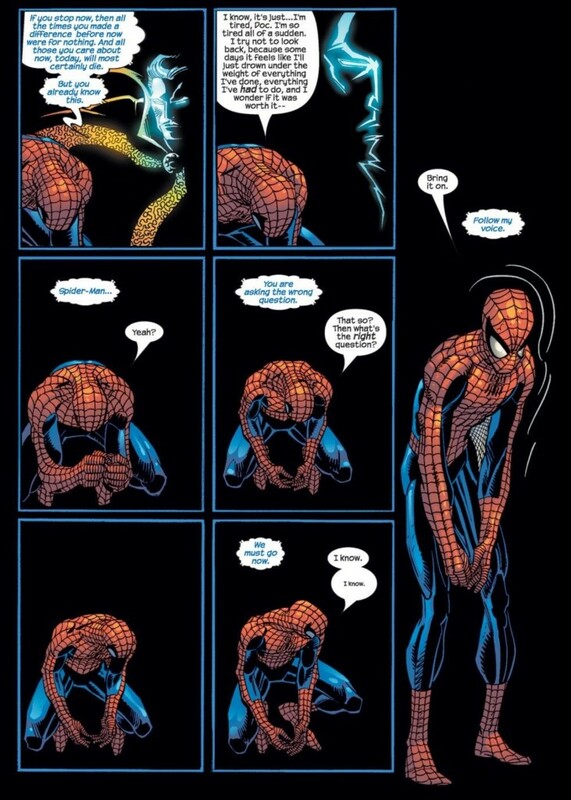 As for the other ASM centennial issues – ASM #100 featured Spidey wanting to quit as a hero for the 900th time and instead growing four additional arms to become a human spider; ASM #200 has all the makings of a classic as a pseudo sequel to Spidey’s Amazing Fantasy #15 origin story, but it’s essentially undone by an otherwise pedestrian Marv Wolfman script; ASM #600 was fun, if not forgettable (though the events do tie-in to the creation of the Superior Spider-Man); and ASM #700 was suitably epic, but again, lacking in execution in too many areas for it to be considered an all-time “great” story. Then there’s ASM #500 – an issue I left out of the aforementioned rant, in large part because it’s the only ASM centennial issue that I’ve never been able to form much of an opinion about. Long-term readers of my blog should note that I had a rather lengthy hiatus from Spider-Man and comics in general in the mid-to-late 90s that trickled into the early 2000s. Let’s just say it was a combination of lack of funds, teen angst and general boredom and frustration with the product that drove me away. My interest was resuscitated when Sam Raimi’s Spider-Man was released in theaters in 2002, but I still wasn’t ready to pledge my heart and soul to collecting Spider-Man again. I had invested a lot of money that I honestly didn’t have into my collection when I was a young teenager, and the fact that I turned on the product so hard by the time the “Clone Saga” was in full swing, made me reluctant to become a full-fledged collector again. However, my passion for the medium ultimately prevailed and sometime around late 2003/early 2004, I was back to buying single issues of ASM. The only problem was when I went to the local comic book shop, I found myself jumping in at issue #503. I couldn’t help but look at the front of that new comic and realize that I had missed the big centennial issue by a lousy three months. The shop where I had picked up ASM #503 didn’t have too many recent back issues, so a few days later I went on to eBay and ordered a lot of comics from the past year, including ASM #500. But when the package arrived in the mail, I did a very strange thing that I still can’t really explain years after the fact: I removed the comics from the envelope and immediately placed them in a shortbox for storage. I never read them. ASM #500 remained a blind spot of mine for a few years – I think until I picked up the “complete” Amazing Spider-Man on DVD in the mid-2000s. While the awesomeness of this gift has since been negated by the Marvel Unlimited app, at the time, this DVD was one of the most amazing things I had ever received because for about $40 I (legally) owned every single issue of ASM in PDF format. All I had to do was load the disc, click on the file and I could check out classic issue of ASM without having to dive into short boxes and risk damaging a piece of my collection by opening the bag and taking it out to read it. At this point, I remember binging on a bunch of J. Michael Straczynski/John Romita Jr. issues. I loved the opening arc of their run, “Coming Home,” and enjoyed a number of other issues, but again, I was oddly cold and disengaged by ASM #500. Maybe I was having a bad day when I read it? Maybe it felt too much like a “greatest hits” album of Spider-Man for me to really embrace it? Either way, once I closed the PDF file for ASM #500 on my computer, I don’t think I ever gave the issue a second thought … until more recently. As you might imagine, when you write a regular blog that’s half-focused on new content and half-focused on old comics, you tend to start planning ahead when it comes to the vintage content because these posts can be written a week, if not weeks, ahead of time. When I realized that my summer review of the “Alien Costume Saga” would be ending without about a week to go in August (in September, I’m planning another theme month of posts), I needed to come up with a classic issue to talk about to fill that one week. 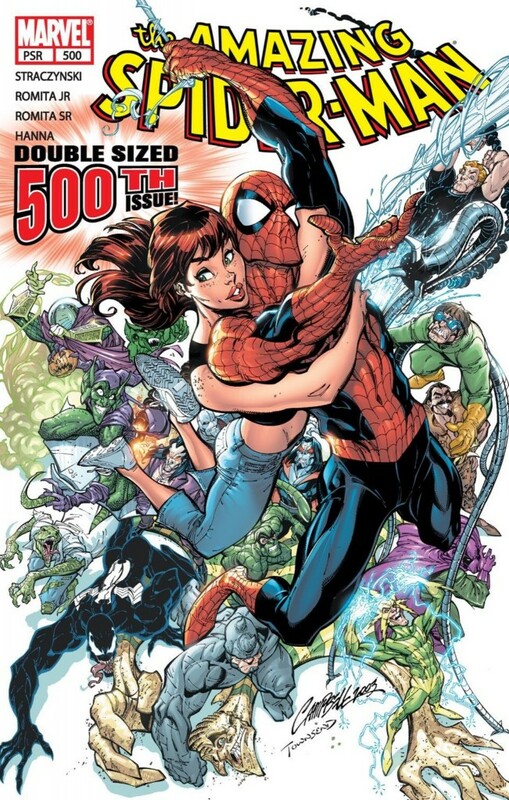 Every other ASM centennial issue is covered to some degree on this site (though, to be fair, I’ve barely written anything about ASM #600, but it did make my top 10 cover list a few years back), except for ASM #500. And that kinda bothers me. So considering that the name of the storyline is “Happy Birthday” and that both Spider-Man and I celebrated our birthdays in August, I decided to make one more attempt to connect with ASM #500, and its two preceding issues, Amazing Spider-Man #57-58 vol. 2 (blah, why couldn’t Marvel just make this simple and officially number these issues ASM #498-499 … a question I’m sure I’ll be asking again when the numbering system inevitably changes for ASM #800). Even when reading “Happy Birthday” with an open mind, there’s still something that inevitably holds it back from being a “classic” arc that’s worth celebrating as an all-time great. The storyline reminds me of this time I stumbled upon a recipe for Red Lobster’s amazingly awesome cheddar bay biscuits. If you’ve never tasted these things, your best bet is to avoid them unless you want to form a legitimate addiction to this delicious concoction of bread, cheese, butter and garlic. On paper, the recipe looked great, and I couldn’t wait until I took these things out of the oven and was able to enjoy some cheddar bay ecstasy in the comfort of my own home. But once the biscuits were done … they were good. Tasty. I had seconds. But they were not the epic Red Lobster cheddar bay biscuits I wanted them to be. And I never made the recipe again. “Happy Birthday” is funny, in that there are unquestionably some funny moments. Peter’s showdown with the administrative assistant at the very beginning of ASM #57 was a very on point depiction of that coworker who just goes out of his/her way to piss you off for no other reason that she/he can. But the joke doesn’t ultimately go anywhere meaningful and gets paid off by Spider-Man having to rescue the woman in costume and sorta being a jerk to her because he can. “Happy Birthday” definitely taps into the age-old conundrum of what it “means” to be Spider-Man, and how that ultimately drives Peter to use his great power in responsible ways. But the storyline doesn’t take a risk and say anything new or exciting about Peter or Spider-Man. 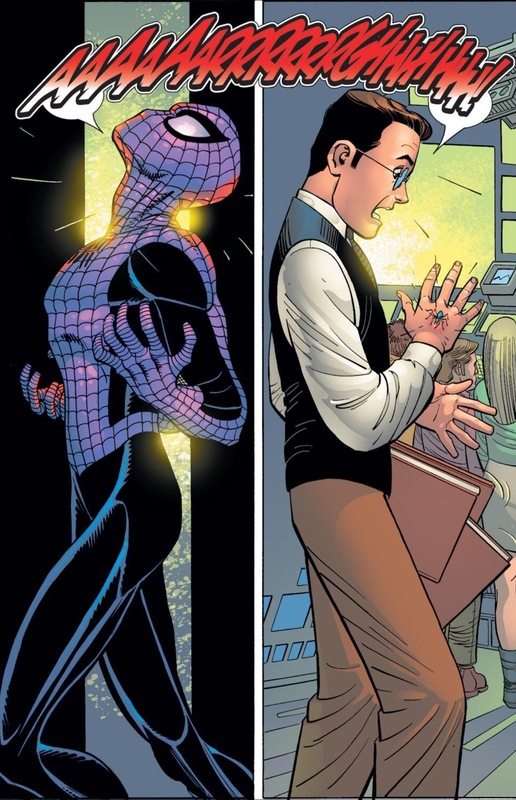 As Peter is trapped in a bit of a time vortex (I’m sure that’s not the best term for it, but just go with it), he starts to progress through his own timeline and as he gets to that very famous part where he’s bitten by a radioactive spider, Peter pauses to debate whether or not he should let the act transpire. He, of course, wonders if erasing the spider-bite from his timeline would ultimately save his Uncle Ben (but think of the millions he’s saved by Spider-Man). And because Peter has had this debate with himself so many times before (remember, I counted 900 around the time ASM #100 was published!! ), this time around he chooses … of course he chooses to be Spider-Man. 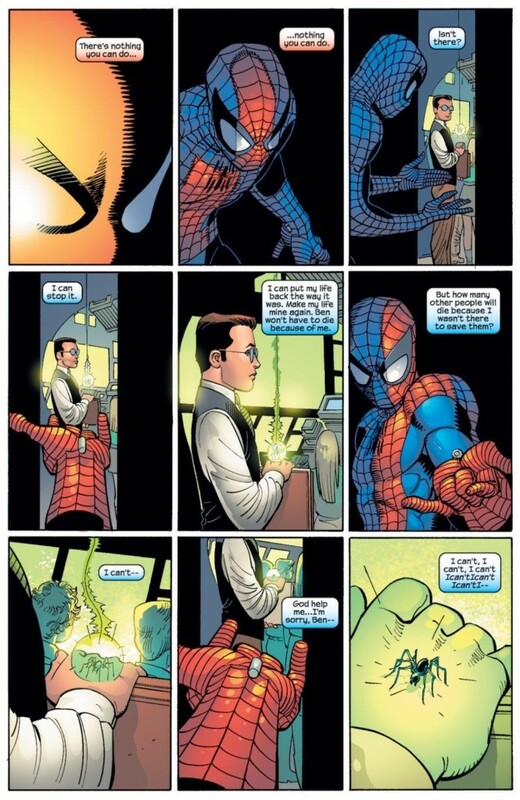 I don’t profess to know what kind of story JMS could have written if Spider-Man had instead decided to skip out on the spider-bite, but at this stage of the character’s development, maybe we needed something different? A lot of the emotional beats that “Happy Birthday” hits – Uncle Ben’s death, Gwen’s death, “If This Be My Destiny” – have been hit so many times, that they just don’t register the same impact anymore, at least from my vantage. I guess I just thought JMS could have done so much more, especially with his one centennial issue. The storyline does feature a fun and appropriate team-up with Doctor Strange (so much so, that I’m now kinda kicking myself for writing about it today, rather than saving it until 2016 when the Doctor Strange movie is expected to come), even if the arc simultaneously functions as a plug for JMS’s upcoming Doctor Strange miniseries. 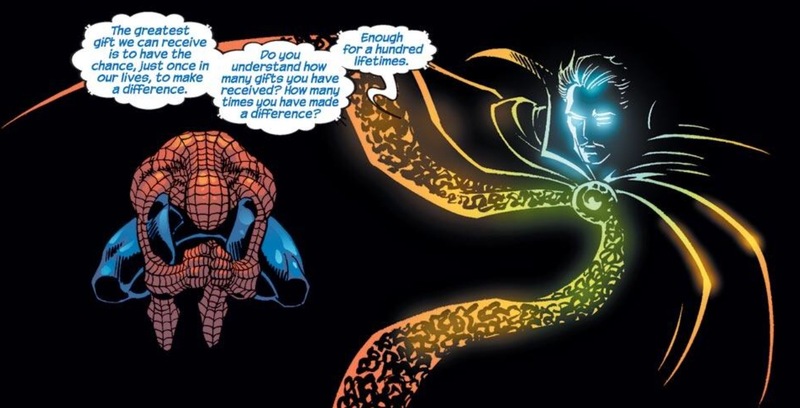 Still, only someone with Strange’s powerset is capable of delivering the kind of macguffin that helps “Happy Birthday” reach its emotional climax towards the end of ASM #500. Obviously, anyone reading this comic for the first time who didn’t think Uncle Ben was going to show up after Peter was granted “five minutes” to spend as he wished via Doctor Strange’s birthday present, should leave the room in shame right now. OK, you can come back in now. 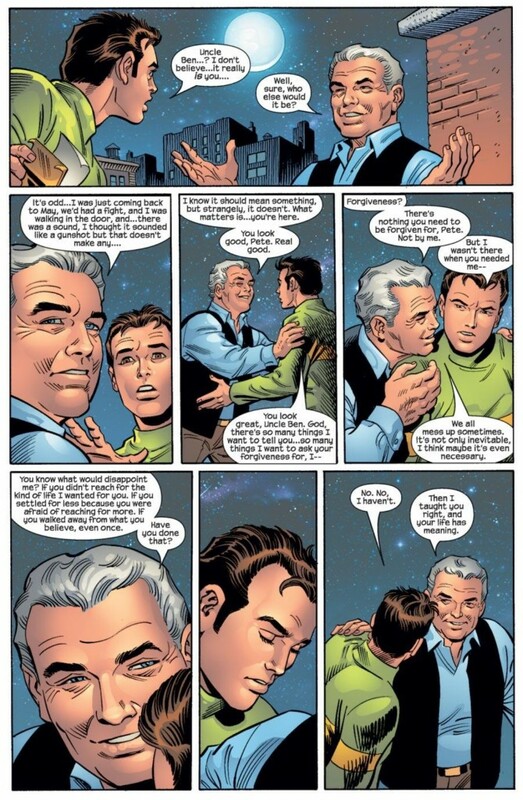 Again, the Peter/Uncle Ben scene is heartfelt and yes, maybe a little sliver of a tear slid down my cheek when I recently reread this story again, but for all of its warmth and emotion, it was still utterly predictable based on how the story was structured leading up to that point. 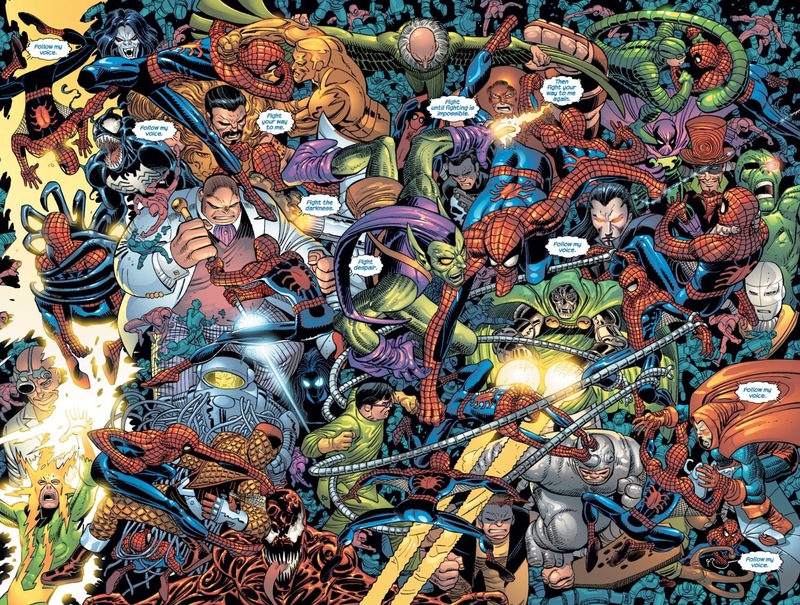 Perhaps I’m just never going to have the kind of relationship with ASM #500 and the “Happy Birthday” arc as a whole, as I do with ASM #300, #400, and to a lesser extent #100 and #700 (#200 and #600 are probably my least favorite stories from the centennial issues). It’s a good story in a “let’s all have a happy centennial” kind of a way, but after giving this thing multiple chances, I’m still yet to walk away from it with that feeling I get when I read a story that I truly, dearly love (like “Coming Home” since we’re talking JMS books). At least now I can say I’ve written about ASM #500 for Chasing Amazing. The monkey is off my back. 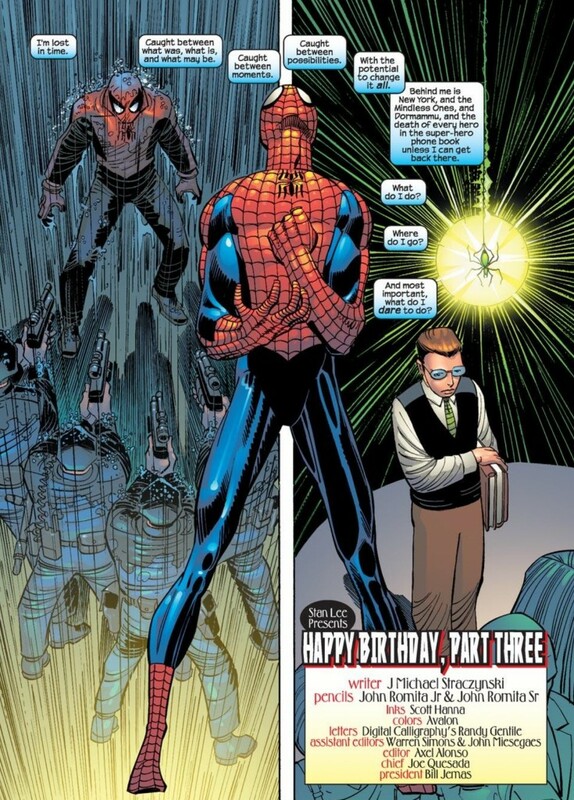 I was just secretly hoping that between getting older, and having read so much more Spider-Man comics than I did when I gave “Happy Birthday” a twirl a few years back, that my perspective on the storyline would have changed. Instead, it’s just another likeable issue that happens to have two zeros on the end of it. I’ll stand up and say I didn’t like this one. JMS wasted the 500 issue anniversary, and the two issues immediately preceding it, on a glorified clip show. The nature of the storyline means that you’re never in doubt about the outcome, and the fact that, with the exception of an Easter Egg in Grim Hunt, these events are never mentioned again, really shows how self-indulgent and pointless this all was. I totally get where you are coming from Mark but I have to admit that this is perhaps my favorite centennial. It could be that it marked the end of that Amazing Spider-Man DVD set, I used that too, and I was anticipating making that mark so badly that it left a very strong impression on me but I would be lying if I said that I haven’t read it dozens of times since then. Firstly, the art is amazing throughout and it has Romita Sr. completing the work of his son… dynamite! I enjoyed this “clip show” more than many others I can think of and having JMS’s dialogue back it up is wonderful. However, I will never forget the Spider-Trenchcoat scene and how wonderfully epic the depiction of Peter’s final moments are. Whenever someone can refer to that awesome costume it sends chills down my spine. I thought the 200th issue was awesome. Peter confronting the burglar, Aunt May taking Spider-man’s hand, Peter coming to the realization that his powers are a blessing and not a curse, how could you not love this story? Spider-man 300 was pretty good and made Venom a great character for quite a while. Spider-Man 100 is so over the top what’s not to love. As a little kid I just went with it. I thought Spider-Man 500 was pretty darn good. Spider-Man 600 was also enjoyable. And of course 400 was a tear jerker but doesn’t seem to hold any wait now. Soap opera all the way back then. I am enjoying Dan Slott’s current run but am sad to see the Black Cat sink so low. I always liked Felicia. Hopefully they will make up somewhere down the road. Sorry, I can’t forgive Wolfman’s god-awful dialogue in ASM #200. Every other panel you have a character calling another one some variation of the word “creep.” The story could potentially be the best thing ever, but when the dialogue is that stilted and repetitive, it grinds things to a halt. I understand that Wolfman is trying to make the Burglar sound colloquial, but it was too over the top. Honestly, I know there is some segment of the fan base that can’t move past what Slott did in ASM #700 and Superior, but I will maintain until the end of time that it freshened up the series in a needed way and probably was the most inspired Spider-Man writing Slott has ever done. The ending to Superior was terrible, but the transition into the series out of “Dying Wish” was quite good, if not flawed to some degree in execution. I would probably rank it above 200, 500 and 600 in terms of centennials, and maybe 100. Well, here it is an example of how our overall experience on a character may influence our views and feelings about a story. So, in my ignorance of past issues and with only a vague idea of the character’s history, I can say I really appreciated this issue, even if I missed the pair that preceded it! Right now I have enough knowledge to get (and agree with) what are you saying on the repetition of old themes, but for a new reader (as I was) it’s full of wonderful moment and interesting questions. In the end, (chrono)logically speaking, you’re right, but emotionally, this issue resonates with importance and epicness. And if anything of my comment doesn’t make sense, it’s because I was interrupted for a long period while I was writing… I may very well have lost the line of discussion.